After three and a half years of on-time publication, El Corno had become an institution. 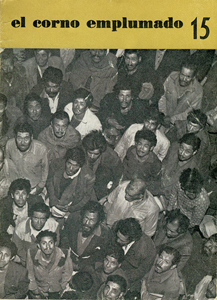 With #15 we broke with our tradition of typographic covers, and used our first cover art: a moving photograph by Mexico’s Nacho Lopez of a group of men—homeless? day laborers? the urban displaced?. In this issue we raised our voice in defense of the Civil Rights Movement in the United States, against the United States’ war of occupation in Vietnam and invasion of the Dominican Republic. El Corno #15 featured a large portfolio of new poetry from Nicaragua. It also included work by Colombia’s William Agudelo; Kathleen Fraser, Paul Blackburn, Carl Solomon, Theodore Enslin, Fielding Dawson, and George Hitchcock from the United States, Miguel Donoso Pareja from Ecuador; and Santiago Mathieu from Argentina. Visual art was by Judith Gutierrez, Halvaro Barrios, and Jaime Carrero, among others.